Hans Gál has been receiving some well-deserved, if belated, attention on disc lately. Just a couple of issues back, I reviewed a must-have recording by cellist Antonio Meneses performing Gál’s very beautiful cello concerto. 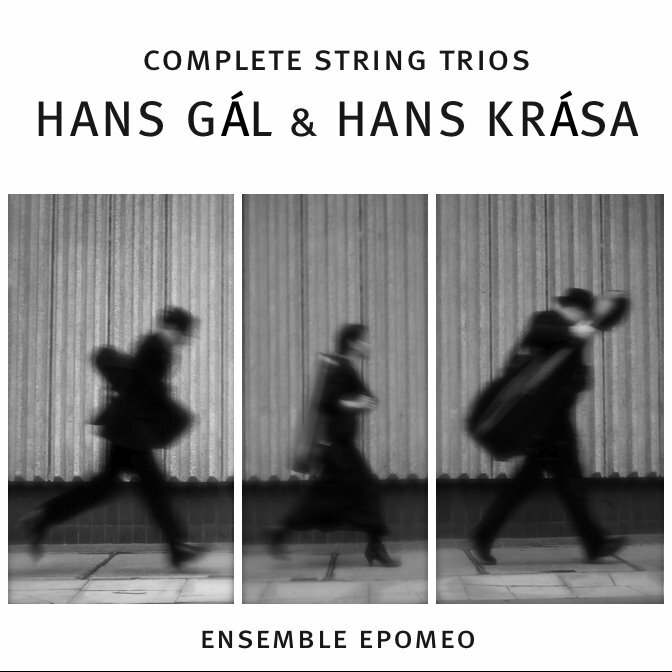 And now, here on the present release, we have what is advertised as the complete string trios of both Gál and his close contemporary, Hans Krása. Though born only nine years apart— Gál in 1890 and Krása in 1899— Gál was fortunate to escape the advancing Nazi forces into Austria, fleeing to the U.K. in 1938 and eventually settling in Edinburg, where he died in 1987. Krása was not so lucky. He was deported first to the Theresienstadt concentration camp and then transferred to Auschwitz where he was killed in 1944. Given Krása’s much shorter life, it’s understandable that his output is considerably less than Gáls’s. Neither composer, however, apparently devoted much effort to the string trio, since the contents of this CD are said to be the extent of it. The two Gál works are recorded here for the first time, and, in terms of scale, they’re both major additions to the literature, each lasting over 25 minutes. Written in 1932, before the serious trouble began, the Serenade lives up to its title, in name, if not strictly in form. The piece is in four movements in what I would describe as a nod to the Baroque and Classical periods as reflected through the lens of an easygoing, listener-friendly modernist style that teases and tickles the ear with fractured and fragmented references to familiar pieces. Throughout the first movement (Capriccioso), for example, you’ll hear the distinctive three-note pattern that permeates the first movement of Bach’s G-Major Brandenburg Concerto. While I wouldn’t want to push the analogy too far, I’d say that to a degree Gál’s Serenade reminds me of some of Hindemith’s Kleine Kammermusik pieces. Gál’s score is mostly busy, breezy, and boffo, perhaps more in the manner of a divertimento than a serenade. Just as long, but in only three movements this time, the Trio in F# Minor is a much later work, dating from 1971, after the trouble was over. The piece was commissioned by the London Viola d’amore Society and originally scored for violin, viola d’amore, and cello, but Gál made this version for traditional string trio at the same time. The mood is now introspective, brooding, and perhaps a bit bereft. If there’s an analogue here, I’d have to say that the Trio seems to look back to the highly chromatic, freely tonal style familiar to us from works of the late 19th- and early 20th-century Viennese composers before they succumbed to the siren of dodecaphonism. In other words, Gál’s Trio is a nostalgic soak in a muddy pond. But mud baths are supposed to be therapeutic, and this one left me with a nice, warm glow. The Krása pieces are considerably shorter—six minutes for Tanec and just under 10 minutes for the Passacaglia and Fugue. Tanec, or Dance, was composed in the last year of Krása’s life. With its strong rhythmic thrust, ostinato figure in the cello, and Hungarian folk flavor, the music is at first suggestive of Bartók, but as Kenneth Woods’s note indicates, the piece is meant to be evocative of trains, with the obvious reference to the boxcars that transported Krása and the millions of others to the death camps. To quote Woods, “the atmosphere ranges from eerie nostalgia, to barely contained menace, to explicit violence,” and ends in a series of manic shrieks. Written later that same year (1944), the Passacaglia and Fugue is Krása’s last completed work. It’s difficult to describe this music of broken spirit and soul. Initially, Shostakovich comes to mind in a frozen soundscape benumbed by cruel and forbidding cold. But slowly, the music rises to a pitch of bickering and physical altercation. The recording at hand represents the Ensemble Epomeo’s disc debut. Named for the Mediterranean volcano, Mt. Epomeo, the group was founded when the three players—Caroline Chin, violin; David Yang, viola; and Kenneth Woods, cello—came together at the Festivale di Musica da Camera d’Ischia in Italy on 2008. It’s always difficult to judge an ensemble in unfamiliar repertoire, but I think I can say that the Epomeo’s musicians are more than up to the technical task of their business and that they sound intensely engaged in the emotional worlds of these two composers and their music. I would now look forward to hearing the ensemble in something more familiar, like Mozart’s great Divertimento in EI Major, K 563, or the Beethoven string trios. Meanwhile, this new, excellent recording is strongly recommended.